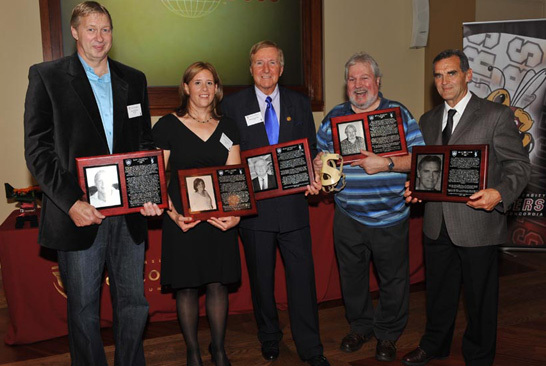 The Concordia University Department of Recreation and Athletics inducted several new members into the Concordia Sports Hall of Fame at a gala dinner held at the John Molson reception room at Molson Breweries in Montreal on October 1, 2010. Four athletes, a builder and a team were inducted as part of ceremonies. These were the 16th Concordia Sports Hall of Fame inductions since the 1974 merger of Loyola College and Sir George Williams University. The 2010 inductees were Concordia Stinger basketball player Gary McKeigan, Sir George Williams hockey stars Alex Matthew and Brian Chapman, Stingers rugby player Josée Lacasse, Loyola-Concordia basketball and football coach Doug Daigneault and the 1991 Concordia women’s rugby team. Originally from Brantford, Ontario, Gary McKeigan joined the Concordia Stingers men’s basketball team as a transfer student from an American college in 1979. The six-foot-six forward had an immediate impact. Not only was he a high scoring, dominant offensive player, he was also outstanding on defence. He was generally regarded as one the hardest workers to ever don a Stinger uniform. Gary scored an impressive 2238 points during the four years he played at Concordia and was highly decorated during that time. Alex Matthew was one of the most talented players in the history of Sir George Williams University’s men’s hockey program. To many, including head coach Paul Arsenault, he was the best forward in the Ottawa-St. Lawrence Athletic Association (OSLAA) in the mid-60s. A right wing, he was respected for his combination of smooth skating, puck handling and shooting ability. Brian Chapman is a Sir George Williams University graduate and was one of its most accomplished hockey players. A clutch goaltender, he was a key component in the University’s great hockey dynasty of the mid-1960s. The Toronto native played with authority and excelled under pressure. He was respected for his fierce competitive spirit, his lightning-quick reflexes and his great agility. An outstanding prop, Josée Lacasse holds the distinction of being the first women’s rugby player inducted into the Concordia Sports Hall of Fame. She was a key player in the Stingers’ great success in the early 1990s, including Concordia’s conference championships in 1991 and 1992. She began her three-year university career in 1990 when she was named the Stingers’ outstanding rookie and earned the first of three consecutive Quebec Student Sports Federation all-star honours. In her last two years, Lacasse was Concordia’s captain and Most Valuable Player. Doug Daigneault was one of the most respected university coaches in Canada. From 1966 to 1989 he amassed an exceptional record as a basketball coach at Loyola College and Concordia University. From 1966 through 1977, he also contributed his considerable coaching talents to the football program. His basketball record over 23 seasons featured a remarkable 487 wins and 243 losses with 14 conference titles. His teams had a 66 consecutive game winning streak in league play from 1968-72. He helped develop seven all-Canadians and 70 league all-stars. Doug was named conference Coach of the Year eight times. Doug’s football record, including seven years as head coach at Loyola-Concordia, was 32 wins, 27 losses and two ties. The 1991 season for the Stingers women’s rugby team was one of the most notable in Concordia’s sports history. With 20 rookies and a new head coach, the team rolled up an 8-1 win-loss record in Quebec university regular season action, outscoring its opponents 162-4. (The only points against came during the lone loss, a 4-3 defeat to the McGill University A team.) The team went on to win the Quebec Student Sports Federation championship. 2010 Concordia University Sports Hall of Fame individual inductees: Gary McKeigan, BFA 86, men’s basketball; Josée Lacasse, BSc 93, women’s rugby; Doug Daigneault, Loyola Warriors and Concordia Stingers men’s basketball and football coach; and Brian Chapman, S BA 67, and Alex Matthew, S BA 67, Sir George Williams Georgians hockey.